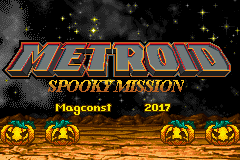 This hack was made for the Metconst 2017 Fall Contest, and is its winner. The hack consists of three large areas, a hub, and a final area. Average blind playthrough is about two hours. Linearity does not exist in this hack, so if you have difficulty in one place, try going elsewhere. Story: Imago is at it again! It now threatens the very existence of Halloween! Getting to Imago is no simple task! It has infiltrated a massive space pumpkin and sealed off all entrances. 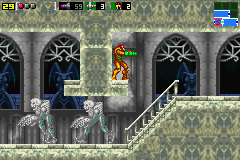 Legend says that every Halloween three Holy beings appear in the physical realm… perhaps with these spooks, as people call them, Samus can gain access to the pumpkin and save Halloween! 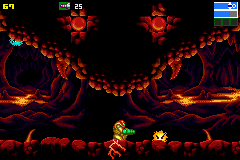 I usually do more in-depth reviews, but in essence, this is basically a Halloween-themed Metroid….classic Metroid with a new look. It can be finished in a day or two and isn’t ridiculously hard. My Rating: 9.75/10 It’s really short and sweet. 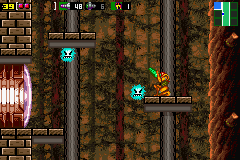 Once you figure out where a few power-ups are, it becomes a pretty simple deal as to where to go. Until then, you’ll likely spend it quite lost if you don’t explore. It’s not perfect, but it’s really worth a play for the fun of it.